The Watershed Impact Trial is designed to explore and educate the public on connections between farming practices and clean water. In partnership with Stroud Water Research Center and with sponsorship from the William Penn Foundation, our goal is to change the management practices of 50,000 acres in the Delaware River Watershed. The Watershed Impact Trial is a comparison of organic and conventional agricultural systems to determine their relative impacts on the environment, especially water quality. 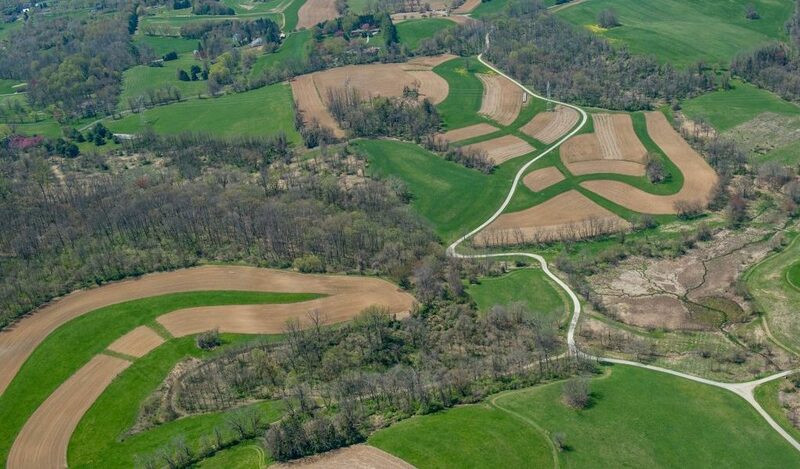 The trial is located on 40 acres of sloped land at the Natural Lands’ Stroud Preserve in Chester County, Pennsylvania. At such a scale, we can extrapolate data to apply to large farms. The topography of the preserve enables us to recreate common conditions, as most runoff occurs on slope. On four large plots, we are growing grain crops using four different management systems: organic with tillage, organic with reduced/rotational tillage, conventional with tillage, and conventional or “conservation” no-till. The trial will run for a minimum of 6 years. The Delaware River Watershed encompasses 13,500 square miles and provides drinking water for approximately 5% of the U.S. population. It is a major recreational and industrial area for residents of New York, New Jersey, Pennsylvania, and Delaware, with an economic value of $25 billion annually. The nitrogen and phosphorus in chemical fertilizers that runoff into waterways cause algae to grow faster than ecosystems can handle, decreasing the oxygen that fish and aquatic life need to survive and causing “dead zones.” The dead zone in the Gulf of Mexico, not even the largest in the world, covers more than 8,500 square miles. Looking upstream at the way we farm can have a huge impact on the quality and quantity of clean, fresh water available worldwide.